DAVID SILVERS PAUL was born in Pennsylvania around May of 1863 to David R. Paul and his wife, the former Sarah Hulings. There was one younger sister, Sarah "Saddie" Paul. The Paul family came more or less en masse to Camden. In the 1880s his uncle, Harry B. Paul, became politically active and served as Postmaster during the administrations of Presidents Grove Cleveland and William McKinley. Interestingly enough, David S. Paul had worked as a letter carrier in the 1880s, prior to his uncle's appointment in 1894. David S. Paul married Laura Ida Norcross. This marriage produced two children, Harry C. Paul in April of 1883 and on August 22, 1885, Eva Norcross Paul. 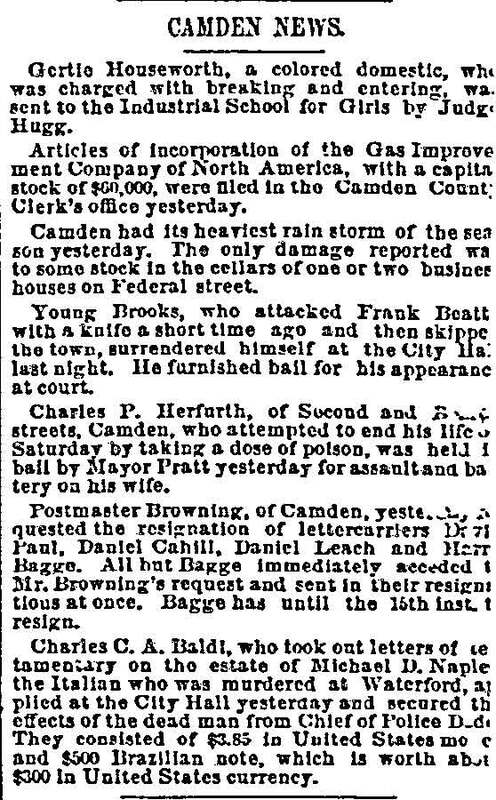 The 1887-1888 Camden City Directory shows David S. Paul working as a letter carrier and living at 545 West Street in South Camden. The following year's edition shows him at 432 Clinton Street. Interestingly enough, seven years after leaving the postal service, David S. Paul and several other Camden letter carriers received settlements from the government to compensate them for overtime work while mailmen. The other Camden mailmen included Daniel W. Leach and Samuel C. Curriden, among others. 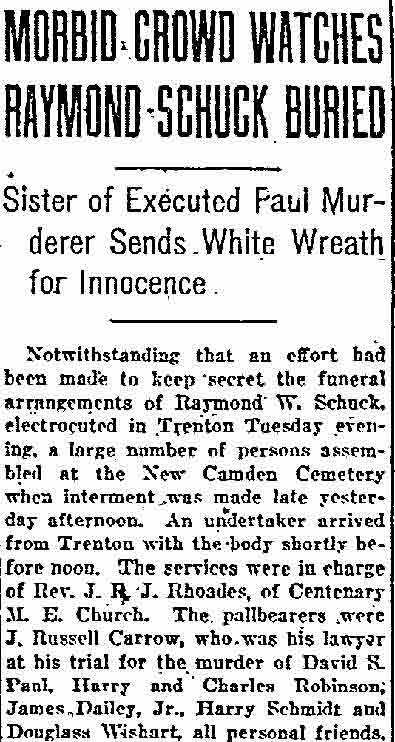 The story was reported in the Philadelphia Inquirer on December 14, 1896. By the time the 1900 Census was enumerated, David S. Paul and family had moved to 764 Line Street, where they would live for many years. When the Census was taken in 1900 David S. Paul was working as a clerk and as an installment collector. By 1906 he was working as a painter, a trade he would follow through at least 1914. In that year's City Directory the Paul family was still living at 764 Line Street. By 1920, with his children grown and on their own, David and Laura Paul rented a small house at 612 Newton Avenue, around the corner from their former quarters on Line Street. This would be David Paul's residence until his untimely death. David Paul he was well liked and respected. He was hired by the Broadway Trust Bank to work as a bank messenger, carrying large sums of cash and securities between his The Broadway Trust and other banks and institutions in Camden and Philadelphia. 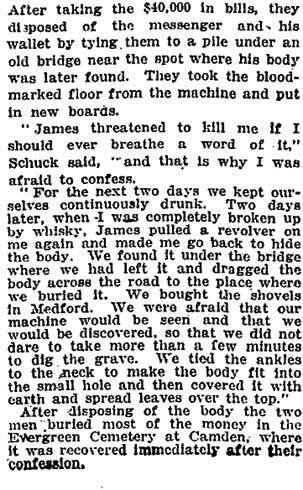 He was working in this capacity when in October of 1920, when he was accosted by two robbers, Raymond Schuck and Frank James, who kidnapped, robbed, and murdered him, concealing his body near Irick's Crossing, a remote spot near Tabernacle in the New Jersey Pine Barrens. Hacked Remains of David Paul, Missing Bank Messenger, Discovered by Gunners. The Authorities of Burlington county have another baffling murder mystery to solve. On Saturday four duck hunters, William and James Cutts, and C.B. Inston, of Tabernacle, and George W. Duncan, of Audubon were passing through the pine forest at Irick's Crossing, near Tabernacle, when their attention was attracted by an automobile track following an old and rarely used trail leading to a stream toward which the gunners were making. As the car was miles off the nearest traveled road the tracks aroused the curiosity of the men and they followed them. In a short time they came upon a freshly made mound over which dead leaves had been thrown. Leading to the mound from the shallow stream nearby were tracks of men and also marks as though some heavy object has been dragged by the men making the tracks. Thinking perhaps that a deer had been shot and secreted there, one or two of the men scratched around the end of the mound with sticks and within six inches of the surface a human foot was unearthed. This put an unexpected phase upon the situation and the gunners decided to let Sheriff Haines continue the investigation. Word was hastily phoned to the jail at Mount Holly and the Sheriff and Detective Parker lost no time in reaching the scene of the tragic discovery. The new-made and crude grave was then opened under the Sheriff's direction. The body proved to be that of a man, fully dressed except for his coat which was lying buried deeper and under the body. The feet were tied with a heavy rope such as is used in towing automobiles and they were resting upward and back over the dead man's head. 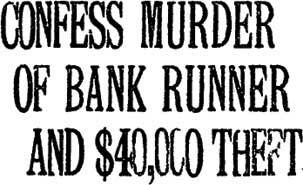 As soon as the features were uncovered Sheriff Haines recognized the dead man as David S. Paul, of Camden, a bank runner, who had been reported missing by the Broadway Trust Company of Camden ten days before, with $65,000 in cash and liberty bonds and $12,500 in checks besides a number of cancelled checks. The body was badly mutilated and it was evident that a brutal murder had been committed. Apparently Paul had been dead but a few hours and the remains were in a good state of preservation when discovered by the merest chance by the gunning party. There was a deep gash on the head as though made by a axe or hatchet, and the forehead was crushed in. Another ghastly wound just above one ear, alone was sufficient to have caused almost instant death. Every indication pointed to the man having been killed and buried within twenty-four hours of the discovery of the crime. The rigor of death had not yet set in and the victim's face appeared to have been freshly shaven. The marks on the ground accompanying the feet tracks leading from the stream about a hundred feet away, were quickly explained when the body was unearthed. Evidently those who brought the body to the unfrequented spot had attempted to secret it in the stream, but finding the water too shallow to conceal the corpse, they had dragged it out again by the rope which bound the feet and pulled it to the spot where the grave was quickly made and the body of the unfortunate man shoved into it. The clothes which Paul wore bore every evidence of being new. The shoes also had evidently just been purchased and the soles bore no evidence of wear. 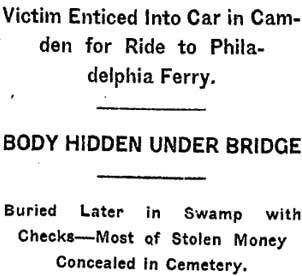 A search of the body failed to reveal any of the cash which the bank messenger is alleged to have taken when he so suddenly dropped out of sight while on his way across the ferry to go to a bank in Philadelphia to take the money, securities and checks for his employers. Only one cent was found in the pockets of the dead man. In the coat was a bundle of checks, said to have been cancelled. There had been no attempt to conceal the identity of the dead man. His watch which had stopped at 9:37, was found in his pocket and a stickpin and in his tie and (as written) a pair of sleeve buttons remained in the cuffs. How the dead man came to his untimely end and how his body happened to be buried in the far away spot in the pines miles from any human habitation, was a mystery when the body was first discovered and it seems to be as much so today, although the authorities here, as well as those of Camden and Philadelphia, are exerting every effort to run down the criminals. It will be recalled that Paul, who was 59 years of age , enjoyed the confidence of the bank officials by whom he had been employed for many years. He was a recent visitor in Mount Holly where he had a son, Harry Paul, and other relatives. On the morning of October 5 Paul started across the river to Philadelphia in company with another bank employee with a satchel said immediately afterward to contain $10,000 in cash and $12,500 in checks. This statement has since been revised and the amount of cash and Liberty Bonds that Paul carried is now variously stated to have been from $45,000 to $65,000. Upon reaching the other bank the other employee became separated from Paul whether by accident or through Paul's design is not yet known and after an attempt to find him at the ferry house, he went at once to the bank and reported his companion's disappearance. 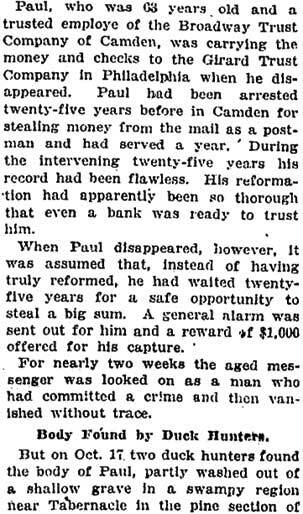 The Central Trust Company was immediately notified and after all efforts to get in touch with the missing messenger had failed the Camden and Philadelphia police were asked to locate Paul. Nothing more was seen or heard of him until his hacked body was discovered in the pines near Tabernacle ten days after his disappearance. What the missing bank runner did during the interim, where he spent his time or with whom he associated while the police of the county were searching for him has not yet been learned but it is expected that the mystery will be solved before long. One clue which seemed to put under suspicion the occupants of a yellow car turned out to be valueless when the owner, hearing of the authorities suspicions, came forward, gave his address as Haddonfield and proved that he drove a party in his yellow car inspecting some real estate in the pines shortly before the discovery of the body of the murdered man. Detective Parker yesterday said that he had just picked up what he considered the first piece of valuable evidence in the case since he stated to work on it on Saturday. He declined to state what this evidence was for the present. There are endless theories being advanced as to how the dead man met his fate and in explanation of his disappearance with the large sum of money entrusted to his custody. Some officials incline to the view that Paul was killed either in Philadelphia or Camden and his body taken to the lonely spot at Irick's Crossing in the confident belief that it never would be discovered or at least not until time had obliterated identifying marks. Another theory is that the murdered man was taken alive in the automobile and killed near the spot where his body and rifled clothes were found. There is no means of telling which theory is correct at this time, quite as possibly both theories are at fault. The body was taken in charge by Coroner Isaac Clover who ordered it removed to the undertaking establishment of Cline & Sons, at Vincentown. There Dr. Longsdorf, of Mount Holly and Dr. Stein, of Camden, performed an autopsy, the result of which showed that Paul come to his death by wounds to the head, probably inflicted by a dull axe or hatchet. There was a conference in Mount Holly on Sunday in which officers of Camden and Burlington counties participated. Those taking part were reticent after coming out of the room in which that meeting was held. In the discussion of the crime and the preparation of plans for running down the murderers, if there were more than one, were Sheriff Haines, Clifford R. Powell and County Detective Parker, of this county, and Prosecutor Wolverton, and Detectives Schregler and Doran, of Camden county. 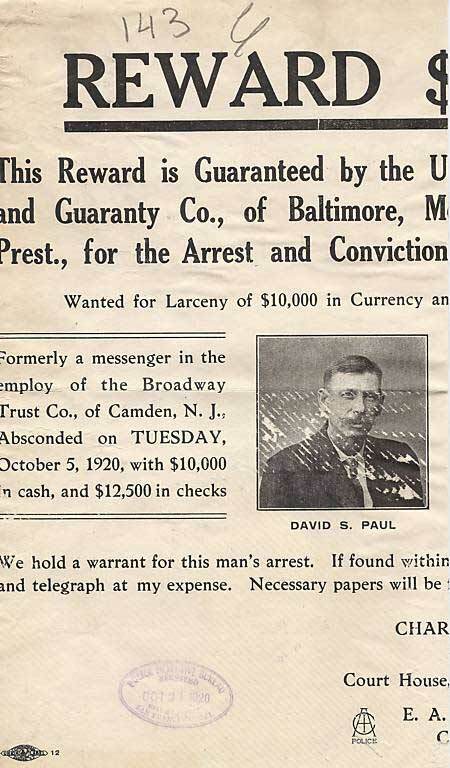 A reward of $1,000 offered by the Broadway Trust Company for the apprehension of Paul shortly after his disappearance is to be increased now for information leading to the capture of his murderers. It is easily the most mystifying case that had come to the attention of the Burlington county officials for many years but they express confidence that it will be solved and the criminals run down. It took the jury only twenty minutes to find Frank J. James guilty of the murder of David S. Paul, at he conclusion of the sensational trial in Camden on Monday night. The verdict carried with it the infliction of the death penalty upon the self-confessed slayer of the bank messenger, the jury refusing the appeal of the prisoner's counsel to exercise clemency and recommend life imprisonment instead of capital punishment. The verdict came at the end of the five-day trial, during which the defendant's oral and written confessions were admitted in evidence in the face of counsel's strenuous objection. Dapper and apparently self-possessed, James entered upon his ordeal last Wednesday but as the trial wore on and damning evidence piled up against him his confidence petered out and several times he collapsed, once having to be taken from the court room in order to allow him to regain his composure. The Camden court house was besieged by a great crowd which clamored for admission to the court room in which the trial was held but the greater number of curiosity seekers were turned away. James offered insanity in his own defense but the evidence sought to be introduced to show that insanity existed in James' family was ruled out and after this failure the insanity defense was virtually abandoned, lawyer Harris admitting to the court during his argument that acquittal would not be asked on the ground of the prisoner's mental irresponsibility. Emphasis was made of the jury's right to find the prisoner guilty of first degree murder with a recommendation to life imprisonment instead of simply finding him guilty of first degree murder, which without the recommendation mentioned carries with it death by the electric chair. "It now becomes your duty to render a verdict on the question of the guilt of Frank J. James. You must be governed by the evidence; in determining questions of fact sole responsibility is upon you. Any comment I may make on the evidence is only to aid you. If there be in your minds a reasonable doubt you must acquit the defendant. 'Reasonable doubt' however, is not a 'possible doubt', because everything in human affairs is open to possible or imaginary doubt. "You will therefore, be justified in assuming that a criminal homicide was committed. The law provides that all murders committed in attempting to commit a robbery shall be of the first degree. You have three choices-of declaring James not guilty, of rendering a verdict of murder in the first degree with no recommendations, or of rendering a verdict of murder in the first degree with recommendations that he be sentenced to life imprisonment at hard labor, and under the law I must be guided by your recommendation if so made." The jury was then sent from the court room and a recess was taken. This was at 4 o'clock. Upon resuming, an hour and a half later, the jury was summoned, it having been announced to the court that a verdict had been reached. When the foreman spoke for the twelve men composing the jury there was a tense stillness in the crowded court room. James seemed to be the most self-possessed of any of the principals in the trial. He presented a picture of composure although the grim set of his jaw indicated the great mental stress under which he was laboring. When the verdict of guilty of murder in the first degree was announced many of those in the room were visibly affected by the words which meant death to the accused man but James, who had almost miraculously recovered his nerve after the break-down during the early stages of the trial, was unmoved. As he was led away to his cell he turned and cast a searching glance over the crowded court room, looking for his relatives but they were not there, having anticipated what the verdict would be and wishing to avoid any more distressing scenes. As he passed out of the court room, to which he will be returned for sentence to the electric chair, James said to the officer who had him in charge, "It is no more than I expected." Counsel for the defense at once filed application for a new trial, and was given ten days in which to file his reasons. It is understood that his appeal will be based on three exceptions to the rulings of Justice Katzenbach. 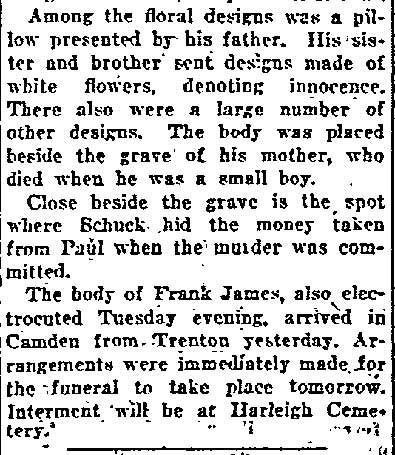 The crime for which James is believed to be certain to pay the death penalty, was one of the most brutal in the criminal annals of Camden County. According to James's confession he conspired with Raymond Schuck to decoy the bank messenger with whom they were both on friendly terms, into an automobile, while Paul was on his way from his place of employment to another financial institution with a large sum of money for the latter. Accordingly they timed their movements so that they met Paul soon after he had left the Central Trust Company on Broadway, and offered to take him to the Camden ferry. When they had entered the almost deserted driveway which parallels the iron shed on Market street leading to the ferry house, James struck Paul from the rear with a heavy piece of automobile spring, repeated blows rendering him unconscious. Paul was pulled back into the rear part of the car and Schuck it is claimed, at James's direction, started out of the city. On the way Paul partly recovered consciousness and pleaded for his life but James again struck him and later fired two shots into his victim's head with the latter's own revolver. The flight of the murderers with their victim's body then led them over into Burlington County. They kept going until they reached a lonely spot at Irick's Crossing near Tabernacle where they pulled the dead man out of the car and tying his feet threw the body into a shallow stream. The trial of Raymond W. Schuck for the murder of David S. Paul, has been postponed from January 4 to February 7. Application for the postponement was made before Supreme Court Justice Katzenbach at Camden on Monday, by J. Russell Carrow, counsel for Schuck. Prosecutor Wolverton did not interpose any objection. The ground on which the postponement was asked was that time might be given for the drawing of a special jury panel. The postponement of Schuck's trial may result in putting off the sentencing of his confederate in crime, Frank James, already convicted of murder in the first degree. 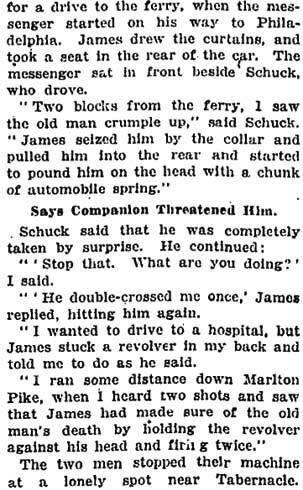 The State may want to use James as a witness against Schuck. The latter claims that he entered into no plot with James to murder Paul and that he had nothing to do with the actual killing, James said that Schuck was as deep in the revolting crime as the former and that as a matter of fact Schuck struck some of the blows that caused death. There is no attempt made to conceal the enmity between the two former friends. Supreme Court Justice Katzenbach has set February 14 as the day for sentence of Frank James, convicted of the murder of David S. Paul, bank messenger, and refused an application of counsel for Raymond W. Schuck for a special panel of talesmen for his trial, set for February 7. The justice granted the application of Lawyers John and William Harris for a writ of error in the James case. The writ will be argued before the Court of Errors on March 1 and will act as a stay in carrying out the sentence of electrocution of James, whose counsel will not press the application for a new trial made on the day of his conviction..
Frank J. James who some time ago was convicted of Paul's murder, was brought before the court in Camden and informed that he would be sentenced on February 25, at 3 o'clock in the afternoon. He was to have been sentenced Monday, but owing to the Shuck trial being delayed the date was advanced. 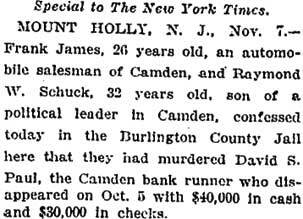 Harry Paul, of Mount Holly, son of David S. Paul, the murdered bank runner, of Camden, had been in attendance at the trial of Raymond Shuck, one of the murderers of the elder Paul, in Camden, when he was interviewed by a newspaper reporter on Monday. Here is what he said after stating that his mother has been in failing physical condition ever since the tragedy, and that he feared she would die as the result of her grief and the shock of the crime. "No matter what happens to these men- Schuck and James- it will not bring my father back to me. "I feel terribly sorry for the families of James and Shuck. No one has any idea of my sympathy for them. "But as for the men themselves, their conscience must be racked by the knowledge that their days seem to be numbered, and their end will be the electric chair. I cannot say I want to see them die as murderers. I cannot move myself to voice such an expression. "I cling to the belief, however, that if they do escape the death penalty, it would be a horrid example for other men with evil in their minds." It took the jury at Camden yesterday less than an hour to return a verdict of first degree murder against Raymond W. Shuck for his part in the murder of David S. Paul. The defendant had been subjected to a grueling cross-examination lasting nearly ten hours in all, by Prosecutor Wolverton, said to have been the longest line of interrogation of a murder defendant ever pursued in a trial in New Jersey. 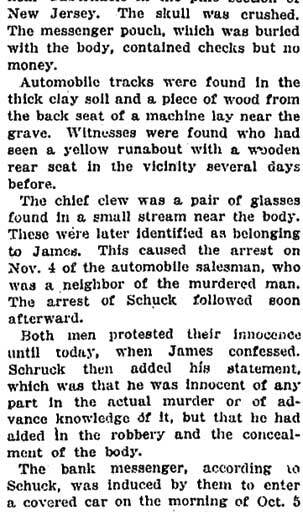 Shuck claimed that he was not a party to the actual murder but was compelled to drive the murder car and help dispose of the body of the victim at Irick's Crossing, near Tabernacle, this county, under threats of death by Frank James, already convicted of murder in the first degree and awaiting the sentence that will send him the electric chair. There was marked feeling between the two accused men when James appeared as a witness for the State. He made no effort to escape his own responsibility for the crime but stoutly maintained that Shuck had assisted in planning the crime and was equally guilty with him. Large crowds witnessed every session of the long trial which lasted all of last week and over into this, being concluded yesterday afternoon after the noon recess. It was evident that J. Russell Carrow, counsel for the prisoner, was fighting to save his client from the chair and that life imprisonment would be a welcome alternative. Even some of those who had worked on the case for the State were not sure that Shuck would be called upon to pay the extreme penalty for his complicity in the foul murder. A recommendation for mercy, included in the jury's verdict of first degree murder would under the law have required the court to pass a sentence of life imprisonment instead of capital punishment. Strangely enough, this bill was introduced and sponsored by Prosecutor Wolverton, when he was a member of the House Assembly some years ago. Shuck's wife stood by her dissolute husband throughout his trying ordeal and aided him in every way in his fight for life. She was evidently on the verge of collapse during the closing hours and when called to the stand fainted before she had been under the Prosecutor's questioning more then two or three minutes. She was not called back, nor was she in the court room when her faithless husband was pronounced equally guilty of the murder of Paul and started on his way to the death chair. He will be sentenced on a date to be fixed later by the court.